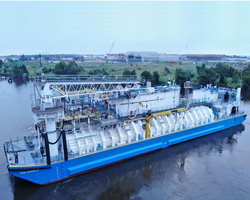 With liquefied natural gas (LNG) emerging as the fuel of choice in US newbuild propulsion projects, an important stage in the development of the country’s fuel supply infrastructure has been realised through the commissioning of a purpose-designed LNG bunker barge, allocated to the port of Jacksonville, Florida. The 71m Clean Jacksonville will bunker TOTE Maritime’s new generation of LNG dual-fuel container ships that maintain scheduled service between Jacksonville and Puerto Rico. Delivered in 2015/2016, these 3,100teu, Marlin-class boxships, Isla Bella and Perla Del Caribe, have hitherto received LNG fuel via truck. By using the 2,200m3-capacity barge—the first such vessel to have been constructed in North America—bunkering efficiency has now been substantially enhanced. Following construction at Conrad Industries’ Conrad Orange Shipyard in Orange, Texas, Clean Jacksonville was transferred to Port Fourchon, Louisiana for gas trials at Harvey Gulf International Marine’s LNG bunkering facility, prior to taking up station in northeast Florida. Designed and engineered by the Rhode Island-based Bristol Harbor Group (BHGI), the barge is installed with a single membrane tank of the Mark III Flex type developed by LNG containment technology specialist Gaz Transport & Technigaz (GTT) of France. BHGI cooperated with all parties involved to obtain ABS and US Coast Guard approvals for this first-of-kind vessel, including participation at the start of the process in a HAZID/HAZOP workshop, as well as a Waterway Suitability Study and Waterway Suitability Risk Assessment. BHGI’s sister company, The Shearer Group, provided technical and shipyard support during the build programme. Clean Jacksonville signifies further technological milestones for North America as the first non-self-propelled barge to embody a GTT membrane system and the first ever project to feature the French company’s REACH4 LNG bunker mast. Denoting ‘Refuelling Equipment Arm, CH4 Methane’, REACH4 applies methods for conventional fuelling adapted to LNG-specific constraints, and is well suited for bunkering most ships, whatever their bunker station arrangement. The mast is fitted with breakaway couplings for safe and reliable emergency disconnections. The barge features a vapour return capability from the recipient vessel and is equipped with an LNG re-cooling unit, designed to optimise the use of any excess boil-off generated in the tank. GTT support also extended to relevant fields of training for the barge crew, commissioning and gas trials.